Yeah, sorry, not written anything for a while. Not because I’ve not been doing anything, I’ve just been spending this year doing more, smaller races, rather than entering any huge monster events (no 24hr races at all so far this year, and none planned ATM! First time that’s happened in around 10 years!). Instead I’ve been immersing myself in the world of midweek local events – the kind you sometimes catch a glimpse of when travelling home from work, or when you head out into the hills for an hour in the evening and wonder “why are those people congregating around a seemingly random lamppost at the side of a main road?”. I’ve raced my first time trial. A pretty horrid experience of realising there’s not much to it other than pedaling into a lot of wind. No distractions, just pedal pedal pedal and wish you had one of those aerodynamic helmets/bikes/impolite skinsuits etc while your entire body becomes a lactic acid storage facility. first time round I stuck in what people suggest is a decent time for someone with no specific equipment (just a lack of sense) of 23mins 20secs and over the next few weeks managed to get that down to just under 23mins. I’ve flung myself round in a bunch during a couple of circuit races. Back in 2011 I did a few and sort of enjoyed them (as much as you can with these things, they do tend to be quite frenetic), so I was quite looking forward to getting back on the track, bar to bar with other riders. first time round I just sat in the pack and reacquainted myself with how the races flow, how to move around in the bunch and how to avoid (as much as possible) the ever present mid pack crashes (so far so good on that front). 2nd time round I decided to get a bit more involved and threw in a good few attacks off the front, chased a few attacks down, tried to get a few breaks going and thought I might do well in the final sprint until I overcooked the final corner and did some unplanned cyclocross off to the side of the course. Sticking with the bunch riding theme, I’ve got back out onto the open road for a “proper” road race again, after really enjoying the first one I did a few years back, then never quite getting round to doing it again. It’s got a lot harder to enter them since then – last time I just turned up on the day and coughed up some (all…) of my money. This time, despite entering online weeks in advance I only got on the “reserve” list and had to wait for several people to drop out before being assured of a ride. In fact I didn’t know one way or the other until about 3 days before! It was worth it though. the course was ace – constantly up or down, decent hills to make a tough race on, a descent fast enough to get a bit twitchy on if you weren’t paying full attention (admittedly in the wet it just got a bit nasty, and a few people paid the price for trying to attack down it) and a finish line at the top of the steepest climb on the route. Nice. 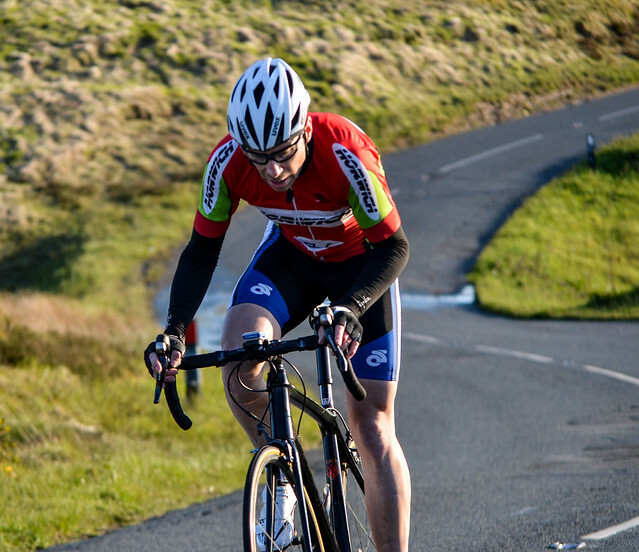 Wednesday evening saw the start of theseries of hill climbs organised by Horwich cc. It seems like no time at all since last year’s hill climb championships, where I sort of sabotaged my own attempt by racing ‘cross (and crashing, and having to run half a lap…which I don’t do very well!) the day before, so in my head I’d planned to have a proper crack at it this year. These summer hill climbs are a great way to get back into the rhythm of it all, so this was to be my ‘baseline’ to build up from. A great turn out of nearly 50 people…and quite a few spectators cheering each rider on up the hill made for a really good atmosphere for a little local club event. My ride wasn’t earth shatteringly good, or even massively competitive in reality. But it was a decent enough effort to improve on and gave me some decent info on what state I’m in right now. It also reminded me how uncomfortable they are. Which I was less grateful for!